Create an A+ cake design by using a festive back to school cake idea for celebrating the first day of school. Whether you share it at home as a family the night before school or take it to class during the first week, everyone is sure to enjoy a cake honoring the start of a new school year. 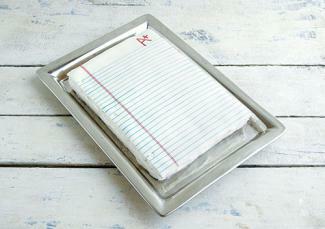 A sheet cake is easy to serve and transport, making it a great choice for bringing to school. The rectangular shape also lends itself to a number of designs that are easy for any decorator to create, regardless of skill level. Easily create a chalkboard using some simple cake decorating techniques. Even if the boards used at your child's school are black, you might want to make the chalkboard green. Black frosting is hard to dye and often tints people's tongues and teeth. It can also stain or even bleed into other colors, especially in buttercream. Frost the cake using a crumb coat of buttercream icing. Once the crumb coat sets, cover the top in green buttercream or fondant. Make the chalkboard border out of brown fondant. Roll out brown or chocolate fondant. Use a toothpick dipped in gel coloring to create a wood grain design in the fondant. Cut one to two inch wide strips of fondant and place around the edges of the cake top. If you wish, you can also cover the sides of the cake in the brown fondant, too. Add a few additional designs to the chalkboard, such as a small eraser and a few pieces of chalk. These can be made of fondant, drawn on using buttercream or even colored onto fondant using edible markers. Pipe white letters to spell out a back to school message, such as "Happy First Day of School" or "Welcome Back, Students!!" Make lined notebook paper using similar techniques as the chalkboard. Crumb coat a cake and then cover it in white fondant or buttercream. Use a ruler and toothpick to lightly draw evenly spaced lines, and then trace over them using light blue frosting. Remember to add a pink vertical line on the left side of the cake. Add a pencil or crayon to the notebook paper and a bright yellow star or A+ to the top. Finally, pipe a message in the center of the paper, using the blue lines as a guide. A shaped cake is impressive for anyone to behold, especially children. Pose your child or the class around the cake for a memorable photograph from the first day of school. Bake a large sheet cake. After cooling, cut it in half horizontally, so you have two long skinny cakes. Stack the two pieces on top of one another, using buttercream to hold the layers together. Crumb coat the cakes and then cover with yellow fondant or buttercream. Pipe lines and the numbers one through 12 (or more, depending on the cake length) along the top part of the cake. Try to space them evenly. Add a black border around the top and bottom to finish the cake. 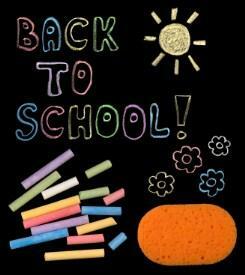 If desired, write the message "Going Back to School RULES!" Bake two sheet cakes and allow them to cool. Using a serrated knife, round the top of one of the cakes. Also round the bottom two corners. Crumb coat this cake. Cut the second cake into fourths. Wrap and freeze three of the four pieces for later use. Crumb coat one of fourth. Stack the smaller cake piece on top of the larger backpack cake to make the pocket. After you have made the book bag shape, frost it as desired. Cover it in bright blue or red fondant or buttercream. Pipe gray or black zipper details onto the cake. Make a name plate in the center of the cake that has a back to school message. Everyone has their own back to school cake ideas that are unique to the school or children in the class. Two ideas for experienced decorators or those who are looking for a challenge are to decorate a 3D cake in the shape of an apple or computer. 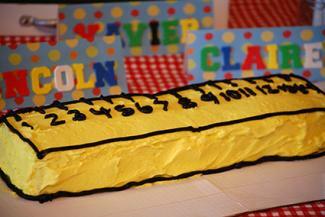 Crayons, pencils, pens or even favorite book characters are additional ways to decorate back to school cakes.